Foodmantra: You’re Arrested, for Trying To Make Me Fat! A Spicy Conspiracy called Mutton Biryani. You’re Arrested, for Trying To Make Me Fat! A Spicy Conspiracy called Mutton Biryani. It all began six months ago, when Mrs. Jagtap sent a bowl full of her delicious mutton biryani over to my house. It was more a tease than a meal. I should have seen it then. I did not eat it the first time, only heard about it, heard about it for months until I came back home for a visit. I was hungry for that biryani, like a ravenous animal, like predator for his prey. Her plan had succeeded; I imagined that fragrance, the spicy mixture and the tender, moist mutton everyday. In the end, I couldn’t stop myself. I arrested Mrs. Jagtap to re-create her beautiful creation and lured her into submission of this recipe in exchange for my Tiramisu. In the end, you gotta Love Thy neighbour, for sending you food! This is recipe is designed to be prepared in 2 parts, so that the work is stress-free and flavour of the marinated meat is better. It is best to marinate the mutton a night before preparing the biryani, so that the flavours soak into the meat. Wash and dry the cut up mutton pieces. In a bowl, mix oil, salt and turmeric with the mutton pieces and let it stand for half an hour. Grind together all the ingredients of the 2nd marinade, except the caramelized onions. Add in the 2nd marinade paste to the marinated mutton along with caramelized onion, garam masala powder and let it stand 4-5 hours or overnight. To make the mutton masala, heat oil in a pan and add in the sliced onion, cook the onions until they brown. Now, add in the grated coconut, garlic. Dry Roast the cloves, peppercorn, cinnamon, coriander seeds, sesame seeds, poppy seeds and kanda lasan masala and grind them together. Cook the mixture till it browns. Add the spice mixture to the pan and then grind it into a smooth paste with oil. To cook the mutton, heat oil in a heavy bottom pan with a fitted lid (You can use a pressure cooker, without closing its lid). Add in the mutton pieces along with the mutton masala paste into the pan. Cook this mutton on low heat with a lid for 1 hour and 15 minutes. Do not add water. (Note: the cooking time can vary from 50 minutes to 1 hour 30minutes depending on the quality and freshness of the mutton) Bite into a piece on mutton to check whether it is softened and completely cooked. Check for salt, season if necessary. Now, remove the mutton pieces out from the masala and dry cook them in a kadhai with fresh coriander leaves for a couple of minutes. This is done to add texture to the meat. Add the pieces back into the masala and set aside. Wash and drain the rice. To cook rice, heat a spoonful of oil and add in the whole spices. Once the spices have browned, add in the rice and sauté it in oil to coat the rice grains. To cook in the same pan, add in salt and 1cup water for every cup of rice, that is, add in 5 cups of water to the rice. Cover with a lid, cook on high heat till the water comes to boil, then turn down the heat and cook till the water is absorbed. To cook in a rice cooker, add the sautéd rice and spices to the rice cooker. Add salt and 1 ½ cup of water for every cup of rice, that is , add 7 ½ cups of water and cook until tender. First, divide the rice into two equal parts. Take a heavy bottom handi or a degchi (Any deep heavy bottom pan can be used) and line the degchi with slices of potatoes on the base. This prevents the rice from sticking to the bottom of the pan and burning, it also makes for a crispy khurchan at the bottom. 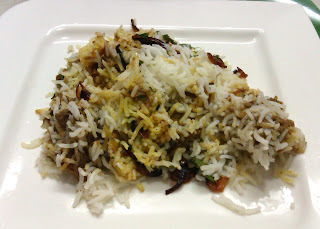 Add the first portion of rice and spread it evenly in the degchi and sprinkle caramelized onion, garam masala powder and chopped coriander leaves on top. Now, add in the mutton masala on top of the rice and spread it evenly for the next layer of the biryani. Finally, add in the top layer of rice over the mutton masala and top it with chopped garam masala powder, coriander leaves and caramelized onions. To give it a smoky flavor or dum, place a steel bowl in the center of the biryani, push it deep and keep a red-hot piece of coal in it. Pour a spoonful of ghee on the hot coal and tightly seal the lid from all sides, keep a heavy weight on the lid to prevent the smoke from escaping. Place this degchi on a hot tava and cook on low heat for 15 minutes. Serve hot.